It was finally upon us: The grueling 40-hour drive from the Vancouver area to Fairbanks, Alaska. We set sail from Golden Ears provincial park to our first destination on the three-night journey: Prince George, BC. We drove about 10 hours that day before arriving in the bustling, totally depressing city of Prince George (aka the capital of northern BC). Our plan for the drive was to camp in various pullouts and free sites we might encounter along the way. However, the lack of forestry combined with the presence of a casino that offered free overnight parking left us with no choice but to spend the night in the Treasure Cove parking lot. Naturally, we felt we had to at least go in the casino to see what PG was all about. As far as casinos go, this one was terrible. After losing $5 CAN on virtual roulette, we returned to tent for the night. Next stop on our journey was Liard River Hot springs. We woke up at the crack of dawn and drove all day to reach the springs. When you are driving through Canada to Alaska at this time of year, there are two things you should know: 1) Gas is super expensive 2) The sun almost never sets. Once we made it past Prince George the scenery improved tremendously. There were mountains upon mountains and wildlife all around us. By the time we reached the overflow campground (free) for the hot springs, it was past 10:30 p.m. We woke up the next morning and went straight to the springs for a nice pre-drive soak. Hot springs have an unmistakable sulphur scent. So when you get in it’s like soaking in rotten egg water, except it is relaxing and therapeutic and very hot. Unfortunately for the pups, no dogs are allowed in, so they had to guard truck while we enjoyed some peace and quiet. We entered the Yukon that day, passing through Watson Lake and Whitehorse. Whitehorse was a particularly cool town. It was large and made you forget you were basically in the middle of nowhere. That night we continued driving until midnight, passing many black bears, elk, caribou and porcupines. 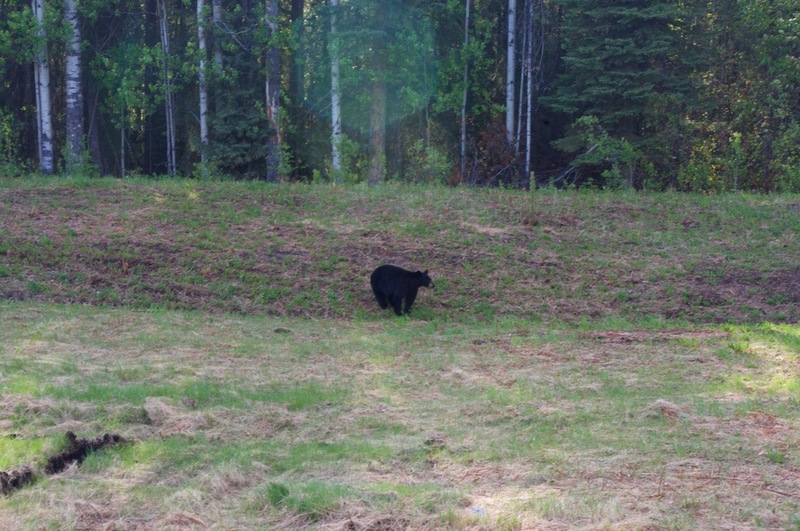 The number of black bears we saw surpassed 20. We also spotted two terrifying grizzly bears a short two miles from where we camped in Destruction Bay. That night we enjoyed Yukon Gold beer and the subtle glow of the midnight sun. The fourth day of driving we finally reached Alaska and cell service. It was a looooooong time coming.